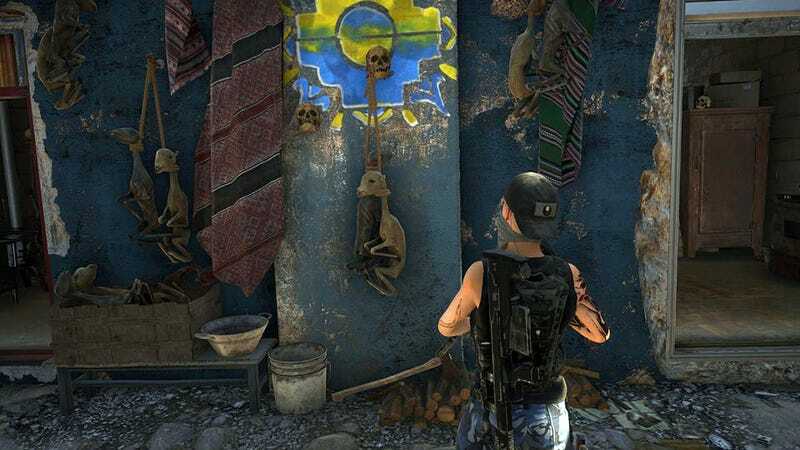 The latest update for Ghost Recon: Wildlands contains a creepy Easter Egg that promises to send players on a witch hunt (literally). Players immediately began to speculate that this was the beginning of a good old-fashioned Easter Egg hunt; and that does indeed seem to be the case. Here’s what they’ve discovered so far. Prior to Wildlands’ “Fallen Ghosts” DLC, Season Challenges were introduced to add new objectives for unlocking more gear. The sixth and final week of the Season 1 Challenges sent players searching for an abominable snowman, requiring them to locate five hints before summoning and killing the infamous El Yeti. Today, players are still searching for clues related to the patch notes’ mention of the “ruined hut” with a specific starting point in mind. The Witch Market is a location in Libertad, and players travel here for the main game’s Marcus Jensen story mission. It seems like this is definitely the place you want to visit if you’re considering joining the witch hunt. The hut contains skeletons, more dead llamas, and a weird pedestal with a mounted pig’s head. Crows circle overhead. Overall, this place is super creepy at night. The walls and roof are all busted up, and the building can definitely be considered ruined. Okay, so we have the hut. What now? Prior to Title Update 5 on June 30, you only had the creepy visuals at the hut, but now you can hear spooky whispering. All signs still point to an upcoming Easter Egg, and several YouTubers in the Wildlands community are searching for further clues. The locations are part of the core game, so you don’t need any DLC expansions to join the fun. Happy hunting! S.E. Doster (@sedoster) is an author, artist, and competitive Call of Duty fanatic who enjoys quoting Buffy the Vampire Slayer.